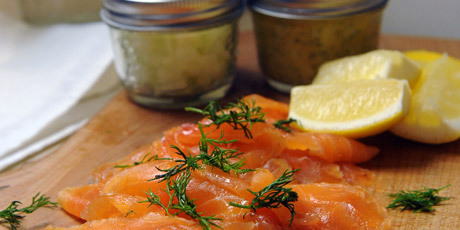 This scandinavian dish combines salmon, herbs and vodka! 1. For the Gravlax, crush the dill with coarse salt and add the brown sugar. 2. Season the salmon fillets with crushed Szechuan peppercorns. Cover with the dill mixture and splash with Vodka. Sandwich the fillets together, tail-to-tail, and cover with plastic wrap. Cover the salmon with another plate and something that weighs about a pound. Refrigerate for 24 hours. 3. After that time, the flesh will have lost its translucence. Rinse under cold water and path dry. 2. Slice the Gravlax thinly on the bias and without the skin. Serve with crackers and the mustard sauce.